We know that God does amazing things every day. He has done amazing things since the beginning. He is powerful, awesome, and loves us in a way that I don't think I can ever truly comprehend. I am in more awe of Him after everything He orchestrated in my life last week. On Wednesday, I got up tired and feeling quite low over the situation with the ileostomy. I was feeling a little hopeful because I had an appointment to see a new surgeon but really hated that I had to travel 2 hours from home to see him. The prospect of having surgery 2 hours from home was daunting, as well. It's not fun being so far from home when you're in hospital. It means your family has the burden of getting there and the prospect of friends visiting, is slim to none. Still, I felt this was my only hope or choice. I have been having to eat early every day because if I don't, I run the risk of being up all night to empty the bag or having it leak. So, I made my main meal of baked chicken, green beans, whole wheat pasta and tomato sauce and ate by 1:00 pm. I was fine for about 30 minutes and then the pain started in my stomach. It felt very much like when I had the stomach flu and I was dreading that as it was a horrible experience with the bag. I felt so bad and was in so much pain, I decided to lie down for awhile and see if it passed. It just kept getting worse and worse. I finally called my husband and he tried to help me. I had a hard time even sitting up and trying to make it to the car seemed like an impossible task but if I had called an ambulance, it would have taken me even longer to get to the Emergency Room that is about 15 minutes from me. Finally, I just gritted my teeth and we got me out to the car and my husband got me to the Emergency Room. I knew at this point something was horribly wrong because there wasn't much out-put in the bag (I am SO sorry to share all this disgusting stuff with you, but it's just part of the story). They got me back fairly fast and I was so distraught at this point and burst into tears. They ordered a CT scan and had me drink that horrible preparation. When nothing from this huge drink showed up in the bag - I knew I probably had a blockage. After several hours of waiting, my suspicion was confirmed. I was so overwhelmed and anxious! What was I going to do? The ER doctor was so kind and caring. He mentioned a local surgeon that I had never heard of. I was so nervous about having a local surgery because my gastric doctor had made such a big deal out of me going to the big city and seeing a surgeon there. I told them I absolutely did not want them calling my original surgeon but maybe they could call the new one? He said they could but he was going to call the local surgeon that was on call first and see what he thought. He came back and said the surgeon would do the surgery and at the same time, he would want to take down the ileostomy. I was still concerned about doing the surgery locally and really was unsure. The ER doctor sat down and gave me such wise counsel. He said the new surgeon may not even consider doing it because I hadn't seen him yet but we had this local surgeon who was confident and ready to move forward. We had to move fairly quickly because having a blockage in the intestine is very dangerous. Suddenly, I knew. I would have this local surgeon do it! My sweet nurse said that I made a great decision and that if she or anyone in her family had to have surgery, they would go to this surgeon. That made me feel a lot better. They said that they would need to get the medical records from the original surgeon before they could proceed but I had them myself! Because I was going to see the new surgeon, I had them at home and my husband was able to go home and get them! So, I was admitted to the hospital but the first thing they had to do was put a tube through my nose and down my throat into my stomach. Yes, I was completely awake for this lovely procedure. It had to be done, though, because they wanted to try and remove as much as possible before the surgery. My husband stayed with me in my room (this hospital is so beautiful and they have beds built in for family to stay in the room) and my son was able to come see me after he got off work. What a blessing! The next morning I was so sick! I had a barf-bag in my hand at all times. The surgeon wanted them to do a test to see how my colon looked before the surgery. Not a pleasant procedure. I was so sick, I ended up throwing up all in my hair. The technician was so kind and took me into the bathroom and washed out my hair as good as she could then gave me one of her own scrunchies and pulled my hair back from my face so I wouldn't have that disgusting mess near my face. Such kindness! Finally, I saw the surgeon and I was impressed with him immediately. One of the first things he said as he went through the original surgeon's notes was what a mess they were. He said in one area she states that I have an ileostomy (which I do) but then calls it an colostomy, which is something entirely different. He said they were hard to understand and he was clearly not impressed at all. He said that he was going to remove the blockage, fix the hernia, and take down the ileostomy. NO MORE BAG!! Surgery went well and he said he would keep me at least 7 days in the hospital. That was fine by me! The hardest part of this whole thing was the tube down my throat because they didn't remove it until Saturday and my throat is still sore, but it's a small price to pay. He was so happy with how I was doing, he let me go home on Easter Sunday - 3 days after surgery! This whole thing was so orchestrated by God! If I hadn't gotten the blockage, I would have never known about this wonderful surgeon right here in my own town. I would still be going around with a ileostomy bag and feeling miserable. The fact that I had the doctor's records was also so great because I'm telling you, had she talked to this surgeon on the phone, she would have said something to put him off doing it. My husband was able to stay with me in my private room and my son came to the hospital every day. This would have been impossible had I gone elsewhere. I am so, so thankful! I can't tell you how happy I am! I thank God all the time for this miracle He performed in my life that has blessed me so very much. I have a drain on the wound, but that's no big deal, either. For one thing, this surgeon placed it where I can bandage it myself after taking my shower. What a concept! I will see him on Friday and he may remove the drain at that time but, even if he doesn't, I don't care. I am so relieved to have that horrible ileostomy gone! Aren't they gorgeous? Don't you love those little chicks in there for Easter? 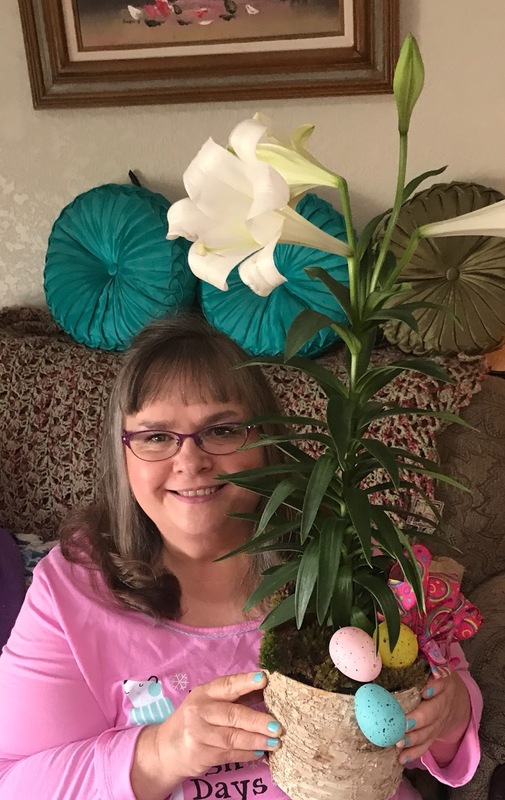 They also sent me this gorgeous Easter Lily! My precious Mitzi was so devastated that I was gone from home for so many days. When I got here, her little eyes were stained from tears. Poor little thing. She's been by my side every moment of the day since I've been home. I missed her as much as she missed me! I am so thankful to God for all He has done! To be completely finished with the bag and be able to move forward with my life is such a relief and it has lifted a dark cloud for me. 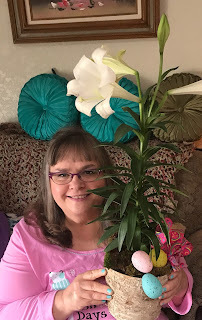 He orchestrated everything perfectly and, what seemed like a horrible thing happening to me on Wednesday, was God's way of blessing me on Thursday and forever. He opened all the right doors and made everything work out in the perfect way that only He can! It's wonderful that your surgery went well and had a good outcome. Very pretty flowers from your parents... love the chicks! Mitzi is so cute!! We had a dog like that when I was a child. Julie I am so very glad this all worked out so very, very well. Praise God! Yes, your flowers are beautiful. Your Mitzi is precious. I am praying for you! Wow. It's amazing how in our worst trials, He is always up to something good. I know I can sure get anxious, but he tells us to fear not. I'm glad it worked out for you and yes, those flowers a so pretty! Oh, dear friend!!!! PRAISE GOD!!!!!!!!!!!!!!!!!!! I am just sitting here totally speechless at the way He answered our many prayers!!! Oh, His ways are perfect and past finding out! Your nightmare is OVER and behind you, and satan lost the battle. GOD Himself fought this battle for you, and you are healed, in Jesus' precious name! To God be all glory, for only He could have orchestrated such a miracle. I can see how much weight you have lost, too, and you are doing such an amazing job. I am just SO happy for you and rejoicing right alongside you! Thank You, dear Jesus!!!! Thank you so much for sharing this wonderful testimony of a true modern-day miraculous answer to prayer. Sending much love to you!